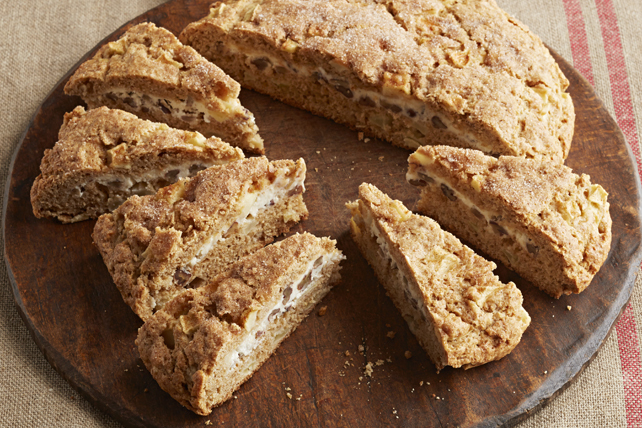 Our Cream Cheese-Filled Apple Scones are crunchy, crispy, sweet and delicious. And these homemade scones have a hidden filling of PHILADELPHIA Cream Cheese! Mix cream cheese, nuts, remaining milk and 1 Tbsp. of the remaining sugar until blended. Divide dough in half; pat each half into 6-inch round on lightly floured surface. Place 1 dough round on baking sheet sprayed with cooking spray; spread with cream cheese mixture to within 1/4 inch of edge. Cover with remaining dough round; press edges together to seal. Combine remaining sugar and cinnamon; sprinkle over dough. Bake 25 to 28 min. or until top is golden brown and toothpick inserted into centre of top layer of dough comes out clean. Cool on baking sheet 10 min. Transfer to cutting board. Cut into 12 wedges. Serve warm or at room temperature. Substitute raisins for the chopped nuts.